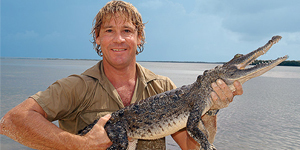 Today would’ve marked the 51st birthday of the Crocodile Hunter, Steve Irwin. This guy was one of my heroes and I loved watching him every time he was on TV. In honor of the great man, here is what I consider to be the funniest ESPN commercial ever, featuring the legendary Aussie, himself. Enjoy.